Amyloid precursor protein (APP) is the transmembrane protein that, if cleaved by the enzyme beta-secretase, produces amyloid beta (the histopathological hallmark of Alzheimer’s disease [AD]). If acted upon by the enzyme alpha-secretase, however, APP cleavage produces neuroprotective compounds. What determines which enzyme will gain access to APP? The answers to this question reveal connections among cardiovascular disease, neurological dysfunction and nutrient insufficiencies that provide the rationale for new therapeutic strategies to prevent AD. Part I of this review discusses recent evidence that Alzheimer’s disease and atherosclerosis are siblings. Amyloid plaque and atherosclerotic plaque have much in common. Both are damage control responses to high cholesterol in a pro-inflammatory environment, the result, in many individuals, of insulin resistance. Amyloid beta (Abeta) plays an apolipoprotein-like role in helping to maintain cerebral cholesterol homeostasis, and Abeta peptides are found in atherosclerotic plaque. In both brain and arteries, soluble Abeta peptides upregulate inducible nitric oxide synthase (iNOS), leading to increased production of reactive nitrogen species (RNS) and reactive oxygen species (ROS). Exacerbated ROS/RNS production results in macrophage activation in the arteries and glial activation in the brain, both of which promote beta-secretase processing of APP and Abeta formation—a potentially vicious cycle. In contrast, alpha-secretase and the metabolic conditions that promote its activation and access to APP—insulin sensitivity, good mitochondrial and endothelial function; a healthy lipid profile, and key micronutrients, including the lead actors necessary for oxidative phosphorylation, vitamin D and retinoic acid—are highly neuroprotective. Part I of this review summarizes the latest research, which reveals that AD is the ultimate outcome in the brain of systemic vascular and glycemic dysregulation. Awareness of what goes awry promotes optimism along with new understanding of the mechanisms underlying dietary and micronutrient modulation, the topic of Part II of our review. The causes of AD are neither mysterious nor untreatable: Alzheimer’s disease is not the inescapable fate of the aging brain. Levels of alpha-secretase (ADAM-10) and APPsα are reduced in the cerebral spinal fluid (CSF) of Alzheimer’s disease (AD) patients compared to controls. Thus, researchers have begun to ask, “What lessens alpha-secretase production or activity, and what might increase it?” Surprising discoveries appearing in the evolving research on APP and Abeta provide potentially therapeutic answers. Be forewarned: many new pieces of the puzzle are emerging. What may, in the following discussion, initially appear to be disparate topics will meld together by this article’s end to present a deeper understanding of Alzheimer’s pathophysiology that enables proactive, effective prevention. Abeta, a readily self-aggregating peptide that produces severe neurotoxicity, particularly in its initial form as a soluble monomer or oligomer*, is eventually deposited in brain tissue interstices in plaques, which, recently styled “the cobwebs of the brain,” are the histopathological hallmarks of AD.6 (*It is now generally recognized that mature amyloid fibrils/plaques are virtually devoid of toxicity to cells; it is their unstable precursors, the oligomers or prefibrillar aggregates of Abeta peptides, that are extremely toxic. )7 For a detailed discussion of this topic, please see the LMR review titled: Alzheimer’s Disease: a 21st Cenury Epidemic. Although Abeta is widely known only for its infamous role as the driving pathological persona in AD, seemingly invented by Nature in order to ruin the aging brain, the impetus for its increased cerebral production is cholesterol homeostasis. New research shows that Abeta’s physiological raison d’etre is to help recycle cholesterol within the brain as well as promote its efflux to the systemic circulation. Increased Abeta production is part of a protective response through which the brain attempts to lower its cellular cholesterol levels. 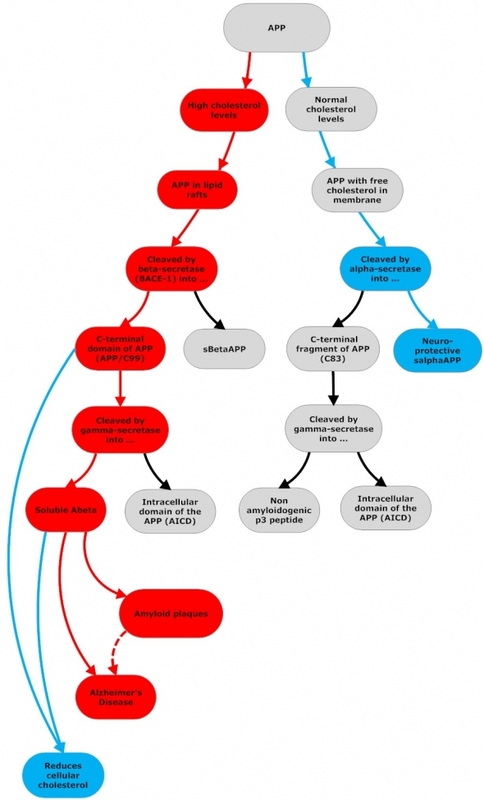 As noted above, Abeta is produced from amyloid precursor protein (APP) in a sequential process in which APP is cleaved first by beta- and then gamma-secretases, enzymes whose activity is upregulated by high levels of cholesterol – one of many reasons why high cholesterol (particularly in individuals carrying the ApoE4 genotype, which binds more avidly to Abeta and is also pro-inflammatory8) is a risk factor for Alzheimer’s disease. Abeta increases cholesterol efflux from cells, assembling high-density lipoprotein-like particles during its secretion. In animal studies, lipoproteins with Abeta are excreted into peripheral tissues much more efficiently than those without Abeta.9 Thus, Abeta is not simply a neuro-terrorist. Abeta plays an apolipoprotein-like role in the maintenance of cerebral cholesterol homeostasis. Cholesterol-rich lipid rafts are platforms where APP clusters in the plasma membrane (the outer cell membrane) of neurons, astrocytes and microglia. When cholesterol concentration decreases in the plasma membrane, so does Abeta production from APP, while neuroprotective alpha-secretase activity goes up. When cholesterol concentrations increase in the plasma membrane, alpha-secretase activity drops, and beta-secretase activity and Abeta production increase. Recently, researchers unexpectedly found that increasing plasma membrane cholesterol caused endosomes in hippocampal neuronal cells to enlarge by 31%.10 (Endosomes are organelles in which molecules are sorted on their way to lysosomes for degradation.) Enlarged endosomes are seen in affected neurons in the brains of AD patients and develop years before either of the neuropathological hallmarks of AD, Abeta plaque and tau hyperphosphorylation, become evident. A large body of evidence now indicates that increased levels of plasma membrane cholesterol promote amyloidogenic processing of APP. Cholesterol normally concentrates in the plasma membrane of neurons and glial cells. The immediate precursor to Abeta, the C-terminal domain of APP (called C99 because it consists of a domain containing 99 residues), is the product of beta-secretase cleavage of APP and the substrate of gamma-secretase cleavage, from which Abeta issues. It now appears that this section of APP has a propensity to bind with cholesterol. Cholesterol within the plasma and endosome membranes is distributed between the two pools: free cholesterol in the bulk membrane and cholesterol associated with lipid rafts. At low plasma membrane/endosomal cholesterol concentrations, free cholesterol and free APP/C99 will predominate, and APP will primarily be subject to alpha-secretase-initiated processing. However, as cholesterol levels in the membrane rise, lipid rafts will predominate. APP/C99 will complex with cholesterol in these rafts, and will be processed by beta- and gamma-secretase. Research suggests that the second and third products in the amyloidogenic pathway—Abeta and the intracellular domain of the APP (AICD)—act to lower cellular cholesterol levels. It has been shown that Abeta stimulates the release of cholesterol and some other lipids from cells in the form of lipoproteins, and also that Abeta fibrills down-regulate cholesterol biosynthesis. In addition, the AICD, which is released when gamma-secretase cleaves C99 to produce Abeta, translocates to the cell nucleus, where it acts as a transcriptional suppressor to the gene that encodes the LRP1 protein. LRP1 is a major apoE receptor in the brain that mediates cellular cholesterol uptake via endocytosis (the process by which cells absorb molecules from outside the cell by engulfing them with their cell membrane). Thus AICD may also help down-regulate cellular cholesterol uptake. APP can be cleaved and processed by either alpha- or beta-secretase enzymes. In both cases, the initial cleavage is followed by an additional cleavage by gamma-secretase. Beta-secretase cleavage produces C99 and APPsβ. C99 is then cleaved again by gamma-secretase and releases Abeta and AICD(APP intracellular domain). Abeta and AICD lower cellular cholesterol levels. (1) Abeta stimulates cholesterol efflux from cells in the form of HDL-like particles in which Abeta is contained; (2) Abeta fibrils (cytosolic Abeta) down-regulate cholesterol biosynthesis by inhibiting HMG-CoA reductase (3) AICD translocates to the cell nucleus and suppresses the gene that encodes LRP1, which mediates cellular cholesterol uptake. In the brain, persistently elevated cholesterol promotes excessive Abeta production, the formation of neurotoxic souble Abeta oligomers, and the deposition of amyloid plaque. When cholesterol levels are within optimal range, alpha-secretase is the constitutive enzyme, APP is channeled to non-amyloidogenic processing, and Abeta is produced in lesser amounts and assists in cholesterol recycling and efflux, helping to maintain cholesterol homeostasis.4 When cholesterol levels remain high, however, Abeta quickly metamorphoses from Dr. Jekyll to Mr. Hyde. APOE e4 allele: ApoE is involved in the binding and clearance of brain Abeta; ApoE2 and ApoE3 are much more effective than apoE4, which is also associated with higher systemic cholesterol levels. ApoE4 promotes a pro-inflammatory and immuno-reactive phenotype, while the other two isoforms, particularly ApoE2, are protective vs. oxidative stress. Decreased plasma apolipoprotein A-1 (apoA-I): the major protein component of HDL, apoA-1 promotes cholesterol efflux. High serum apoA-1 is linked to decreased risk of coronary artery disease; also to significantly lower risk of dementia if not carrying an ApoE4 allele. Vascular dementia and LOAD also share numerous risk factors including hypertension, dyslipidemia and diabetes. In contrast, alpha-secretase activity is optimized in cell surface membrane regions with few lipid rafts, especially areas with high fluidity where this secretase is primarily localized, another reason for the importance of the most fluid of all fats, the omega-3 fatty acid, DHA, in promoting a-secretase activity and cognitive function.15 For a detailed discussion of this topic, please see the LMR review titled Omega-3s, ApoE Genotype and Cognitive Decline. Brain cholesterol is essential for a wide variety of key brain functions, and when released from degenerating nerve terminals, is actively recycled by glial cells and astrocytes, esterified by cholesterol esterase, then cleared from the extracellular matrix by binding, primarily to ApoE, which delivers it to neurons. A negative feedback loop between free cholesterol, Abeta and HMG-CoA reductase maintains intracellular cholesterol equilibrium in the brain. In the AD brain, however, this orderly process of cholesterol turnover is impaired. AD can be classified broadly into two groups, early onset AD (EOAD, occurring < 65 years) and late-onset AD (LOAD, occurring > 65 years). EOAD, although the most severe form, accounts for only a small percentage of AD cases (<5%), and the majority of these are caused by mutations in one of three genes: those for APP, presenilin (PS) 1 and PS2. In the adult brain, astrocytes not only synthesize, but also internalize and recycle the cholesterol released from degenerating nerve terminals. This recycled cholesterol is then delivered back to neurons, an activity that requires cholesterol’s binding to one of the variants of apolipoprotein E (ApoE), which serves as the major lipoprotein in the CNS. ApoE is a ligand for cell surface lipoprotein receptors (including the APP chaperones noted above); is responsible for regulating lipid transport among brain cells; and clears cholesterol from the extracellular space, delivering it to the lysosomes for recycling. While the intact BBB normally largely prevents cholesterol import into the CNS from the peripheral circulation, vascular injury can enable cholesterol-carrying lipoproteins to gain relatively easy access to the CNS. This results in increased brain membrane cholesterol, increased beta-secretase cleavage of APP, and increased generation of Abeta peptides. In addition, oxidized cholesterol derivatives found in the circulating blood can also cross the BBB. Hence, any vascular damage (e.g., the endothelial damage seen in atherosclerosis, hypertension, MetS, diabetes) can result in increased importation of damaged cholesterol into the brain.2021 This is where systemic, not just cerebral, endothelial dysfunction enters the AD causality chain. Recent data indicate that by enhancing iNOS production, Abeta peptides in atherosclerotic plaque promote vasoconstriction that ultimately reduces cerebral blood flow and increases the production of superoxide by NADPH oxidase, which is located in both vascular and brain cell membranes. The outcomes: damage to the vascular endothelium, reduced brain perfusion and cerebral ischemia, increased production of iNOS, glial activation, mitochondrial dysfunction – a brain-destructive Pachinko game. Altered cholesterol metabolism results in failure to clear Abeta and a chronic inflammatory response by the microglia, the brain’s version of macrophages, which are surprisingly similar to those found in the intima of atherosclerotic lesions. Brain microglia produce virtually all the same cytokines, chemokines, growth factors, enzymes, complement and coagulation factors, and ROS, as their vascular counterparts, plus the microglia express many of the same surface receptors that mediate local immune reactions. In addition to microglia, both astrocytes and neurons, also swing into action, producing inflammatory mediators, including C-reactive protein, amyloid P, and complement factors.13 All of this contributes to increased production of ROS and RNS, endothelial dysfunction, mitochondrial dysfunction, hypoxia—sound familiar?—many roads to Rome, all converging on Alzheimer’s disease. 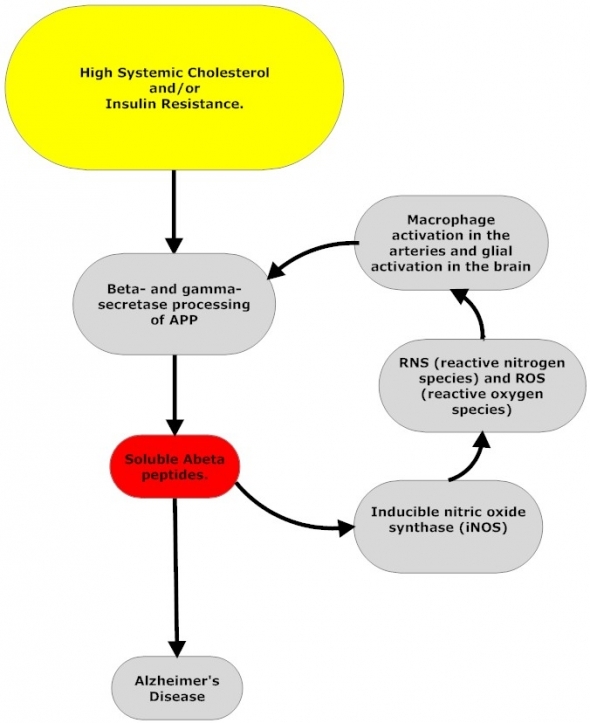 In both brain and arteries, soluble Abeta peptides upregulate inducible nitric oxide synthase (iNOS), leading to increased production of reactive nitrogen species (RNS) and reactive oxygen species (ROS). Whether induced by high cholesterol or insulin resistance, exacerbated ROS/RNS production in the systemic vasculature results in the activation of platelets (the most important peripheral source of APP, containing APP concentrations equivalent to those found in brain) and macrophages in the arteries and glial activation in the brain, both of which promote beta-secretase processing of APP and Abeta formation—a potentially vicious cycle. Insulin resistance/chronically elevated levels of insulin in the periphery correlates with a reduction in cerebro-glucose metabolism that can be seen years before a diagnosis of Alzheimer’s disease and results in impaired mitochondrial energy production (more ROS, RNS) and increased Abeta production. Insulin regulates Abeta in several ways. When insulin crosses the blood brain barrier, its presence in the brain increases the expression of insulin-degrading enzyme, which also degrades Abeta. 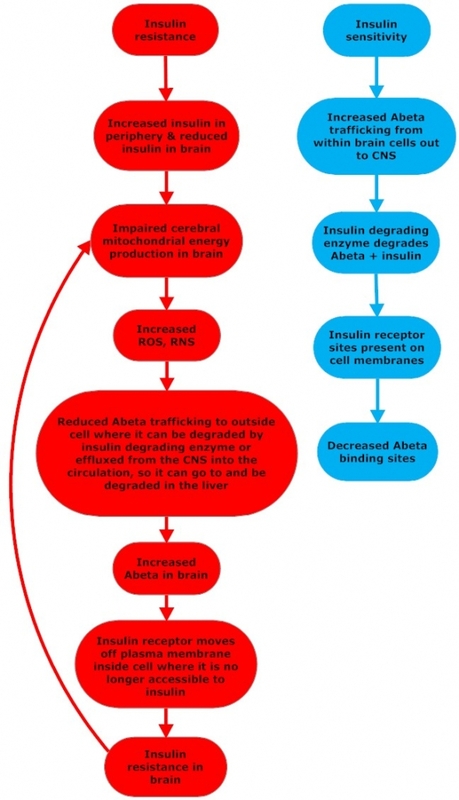 Insulin promotes Abeta trafficking into the extracellular space in the brain where it can be degraded by insulin-degrading enzyme or drain into the spinal fluid, be effluxed into the systemic circulation and delivered to the liver for removal. Insulin also down-regulates the expression of Abeta binding sites. In reciprocal fashion, when Abeta binds to dendrites it promotes insulin resistance by causing the neurons’ insulin receptors to move off the cell surface and into the cell body, where they are no longer accessible to insulin. According to Dr. Craft, if you take a group of patients with AD, about 50% will have the ApoE4 allele, a much higher percentage of ApoE4 carriers than in the general population. The other 50% have AD but do not have an identified genetic risk factor. Interestingly, these patients are much more likely to be insulin resistant. Although the mechanisms differ through which ApoE4 and insulin resistance initiate pathology, both promote dyslipidemia, endothelial dysfunction and damage, and oxidative stress—effects that interact with Abeta to produce the final common pathway that results in AD. Furthermore, we now know that the CNS and the periphery are closely interrelated, and each is capable of driving AD pathology. Dietary insults provoke insulin resistance, endothelial dysfunction, and dyslipidemia—and affect the CNS. In the brain, Abeta causes insulin resistance that may drive compensatory insulin resistance in the periphery. Insulin resistance promotes endothelial dysfunction/hypertension and dyslipidemia/atherosclerosis (and food sensitivities/allergies/gut dysbiosis – but that’s another topic necessitating its own review). Any one or any combination of these can engender a leaky blood brain barrier that impacts Abeta transport (both efflux and influx) between the brain and the periphery. The end result is increased levels of Abeta in the brain, increased Abeta-induced inflammation and damage to the endothelium, increased deposition of Abeta plaque–and AD. The bad news is that is has become abundantly clear that no single molecular target or silver bullet will prevent or cure AD. The good news is that the latest research is moving to a model in which therapies with pleiotropic effects on metabolic function combine to decrease the risk of developing AD. The best news is that all identified risk factors for AD are modifiable. There is only one genetic risk factor, ApoE4, and actualization of its potential negative effects involves interaction with environmental factors—the incremental insults that result from poor diet, micronutrient insufficiencies and an inactive lifestyle. Although the complexity of what has been called “the morass of intermediary metabolism” appears daunting, Dr. Crarft remains optimistic. The inter-relationships among the myriad modulators of system and cellular function offer the happy prospect that intervention at one level of the metabolic web may have beneficial effects across many levels. For example, treatment that restores insulin sensitivity also typically improves endothelial function and lipid profiles. Part II of this review will discuss what the research is revealing to be the most promising means of getting off the side roads that funnel into the Alzheimer’s Interstate. EDITORS NOTE: We are scheduled to post part II of this article on May 14, 2010 or a bit sooner.